If you are a regular listener to this series, you might correctly surmise that I go in for interesting, innovative music that mixes genres, with acoustic instrumentation being a definite plus. But I'm also a sucker for clever, infectious pop music, with the Beatles Sgt. Peppers being the gold standard. So this week we have another one of those albums of particularly clever music that hits all the right buttons, with hummable tunes, a beat you can move to, and bright, witty, lyrics. It's the new fourth studio album by the band called Fountains of Wayne. The CD is titled Traffic and Weather. Fountains of Wayne emerged in the mid 1990s with an eponymous release that attracted a fair amount of critical attention. In 2003 they had a hit with the song Stacy's Mom from their last full studio album Welcome Interstate Managers. Now, after what is turning out to be a fairly typically long hiatus of four years, they are out with Traffic and Weather. Despite the long gaps between albums, Fountains of Wayne's members have been keeping busy with side projects, including creating music for a couple of films. Bassist and co-principal songwriter Adam Schlesinger owns a studio in New York with James Iha of the Smashing Pumpkins, and often works as a producer. But Fountains of Wayne does tour regularly, and they have to allocate time to come up with new material. They have done that, and the result is worth the wait. Schlesinger and guitarist and lead vocalist Chris Collingwood have come up with a batch of 14 songs that are paragons of succinct pop narratives, most of which tell a little story usually about the consequences of love, from lonely people who just might meet, to finding love at the Department of Motor Vehicles to sharing the experience of lost airline luggage. Each song is almost epigrammatic in its ability to tell the story briefly but vividly, while the infectious musical setting often conjures British-invasion sounds from the psychedelic-era Beatles to ELO, to bits of 1960s folk-rock. The personnel remains as Fountains of Wayne have been, when they get together, Collingwood on guitars and lead vocals, Adam Schlesinger on bass, guitar, keyboard and other things, plus Jody Porter on the other guitar, and Brian Young on the drums. Like the Beatles' Lennon & McCartney, Fountains of Wayne's songs on this CD are credited to both Schlesinger and Collingwood, even though Schlesinger says they don't write together. Schlesinger says they now live in different states. Each contributes his own songs to the band, and their styles are quite similar, so it's hard to tell whose songs are whose. But the band works well together as a unit, with tight musicianship and the kind of appealing sound that distinguishes this kind of high-class pop. 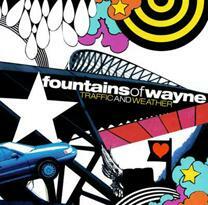 Traffic and Weather, the new CD by Fountains of Wayne, their first new recording in four years, is I think, the band's best yet. It features somewhat more instrumentation than some of their previous CDs, but they rise to the production well. The band serves up the essence of what clever pop should be -- tunes you can hum and dance to, with great lyrics that tell distinct stories within the confines of each track. They bring a sense of whimsy to many of their songs, and their often-retro-sounding band arrangements are done with a lot of class, further enhancing the album's appeal. Sonically, we'll give the CD a grade "A." The mix puts everything in the right place, and you can hear Collingwood's every word of the vocals. And the sound is not too overly compressed, so there is a bit of dynamic range, which is appreciated. Intelligent adroit musically sophisticated pop has a long history, going back, most notably to the Beatles. For me, that kind of music still has appeal, especially when done as well as it is by Fountains of Wayne.